I didn’t realize just how big a part music plays in my parenting style – and survival – until my husband took the Amazon echo from our kitchen outside one afternoon to work in the backyard. Tasked with something as simple as serving an afternoon snack to my three sons ages 3 and under, I must have called out for Alexa two or three times, maybe more. It’s Johnny, Wes’ twin brother, frustrated on the floor because he wants a toy from a brother or a way out of the “Baby Zoo,” as my husband dubbed the dining room we enclosed with gates. “Johnny let’s do ‘Row, Row, Row your boat,’” I’ll say. And he is smiling by our third or fourth rock as we row imaginary paddles. Then there are the doozies, when all three boys whip into a shrieking frenzy – a trick they’ve learned gets Mama’s attention and bugs a brother. When walking out of the room, as the pediatrician suggested, doesn’t seem to work, I’ll pull out my ace in the hole: “Alexa, play Old MacDonald.” Wade’s favorite, and by transitive property of brotherhood, the twins’ too. The younger boys can’t talk in complete sentences yet, but by gosh, they can put their little hands on their heads for cow ears and fingers to their noses for the pig, like Daddy taught Wade to do when he heard “Old MacDonald” at their age. For Wes, we pulled from the ‘70s and turned Hall & Oates’ “Sara Smile” into “Wesley Smile” so he’d have “his own” song too. Then there’s music especially for Mama. Alexa will cue up Justin Timberlake’s “Can’t Stop the Feeling” on the most cross-eyed mornings when I have no idea how I’m going to make it through the day. For extra moody moments, when I’m ready to pounce on my husband for no good reason, Alexa will play “Sullivan Street” by the Counting Crows. Argument avoided. There’re selections from “The Who” to psych me up for dirty dishes waiting in the sink, and Sarah McLachlan to give me a few moments of escape while I brush my teeth. We’ve got Pandora in the car – the toddler station for the trip to preschool, Alison Krauss radio for the way home. And best of all, there are musical moments at bedtime when Wade decides to sing “Pass it On” or “Johnny Appleseed” all by himself, filling my heart with the spirit of songs I learned growing up. 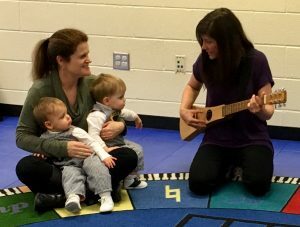 I have a feeling my boys are learning to love music for the same reasons I do; it feeds the soul and puts a smile on your face – or dries a tear – in the matter of a seconds. 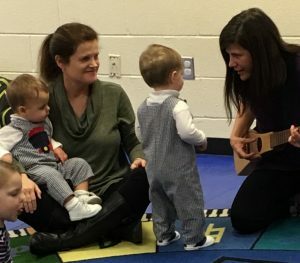 But another way I’d like to think I can encourage their appreciation for music is by taking them to Music Together, the music classes we fell in love when Wade was a baby. 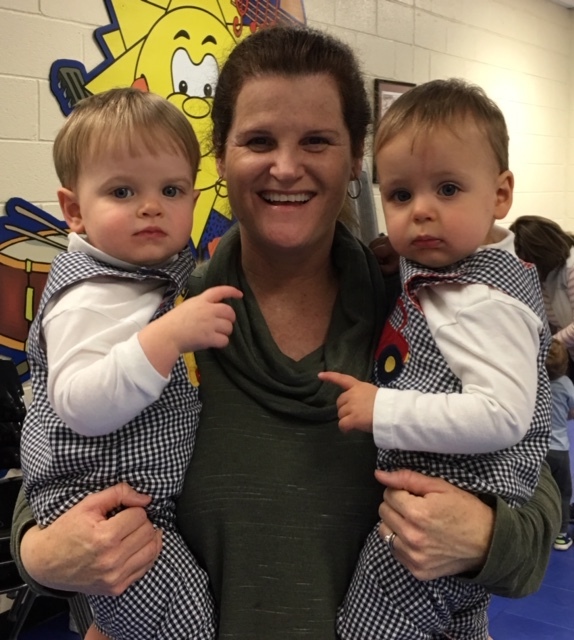 The twins and I just started a spring session at Dilworth Elementary School on Friday (classes are taught all year long at locations throughout Charlotte.) I was reminded all over again how incredible the program is. 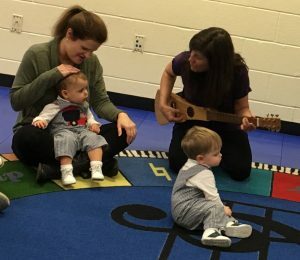 You get down with your child (or children – families welcome) in a circle on the floor and spend 45 minutes, singing, rocking, cuddling, and dancing with them. You shake shakers, drum the floor, your knees, your child’s knees, whatever the music dictates. You get lost in a beautiful moment, where you’ve put away devices and distractions and give your children your undivided attention. All the while they are learning things you don’t even have to think about. The experts at Music Together like our teacher Lucy Chapman, who happens to be an ol’ high school friend of mine (bonus!!) have done all the thinking and planning ahead. They have a reason for every note, every movement and every spontaneous way they involve the children in the class. 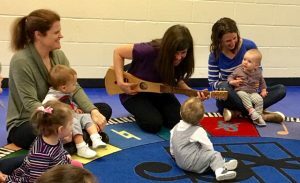 All you have to do is sit back and watch your kids’ eyes light up when they recognize a song, learn to follow along, find their own voice, or make up their own dance. Not only do you get to witness it all but take part in the process, which is something to cherish before real school starts and your kids are whisked away for most of the day. For more information, go to www.musictogetherofcharlotte.com.